The historical record of global temperatures comes from various sources since instrumentally recorded temperatures exist for just over 100 - 150 years. For many parts of the world the instrumental measurements are sparse. The satellite data era began in 1979. The popular global warming theory is that anthropogenic CO2 emissions have caused unprecedented global warming in the second half of the 20th century. If it the late 20th century warming can’t be shown to be unprecedented, then there is a major problem with the theory. The pre-historical record has been derived by various researchers using different types of proxy measurements. The IPCC requires elimination of the Medieval Warm Period since many researchers believe it was as warm then. The Intergovernmental Panel on Climate Change (IPCC) is a United Nations based group focused on evaluating global climate change. The following figure is from their AR4 report (2007). It shows their calculated global average temperature for 1850 to 2006. From the above graph it appears that the global average temperature has increased by approximately 0.8 degree over the last 150 years. Since widespread, reliable instrumental records are available only for the last 100 – 150 years or so, climatic conditions in the more distant past are estimated by analyzing proxy evidence from other sources. Proxies include tree rings, corals, ocean and lake sediments, cave deposits, ice cores, boreholes, glaciers, and documentary evidence. Knowledge of past climates is necessary in order to put the recent climate into a broader context. Starting in the late 1990s, scientists began combining proxy evidence from many different locations in an effort to estimate surface temperature changes averaged over broad geographic regions over various time frames. 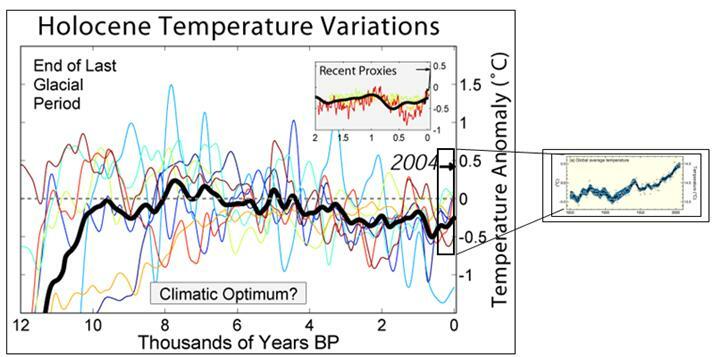 The first of these reconstructions published in 1998 and 1999 by Michael Mann, Raymond Bradley, and Malcolm Hughes, (MBH) attracted considerable attention because the authors concluded that the Northern Hemisphere was warmer during the late 20th century than at any other time during the past millennium. Controversy arose because many people interpreted this result as definitive evidence of anthropogenic causes of recent climate change, while others criticized the methodologies and data that were used. The following figure shows average northern hemisphere temperature anomalies for the last 1000 years and is known as the “hockey-stick” graph (due to its shape). The “hockey-stick” graph was eventually debunked by the National Academy of Sciences, as described below. The above figure shows an apparent slight cooling trend for most of the last 1000 years with a definite uptrend in the last 100 years. This leads to the assumption that it has anthropogenic cause since this period is the industrial age. The gray banding in the figure indicates the levels of uncertainty in the data. In 1998 Nature published the first Mann hockey stick paper, commonly called “MBH98.” Mann et al. followed up in 1999 with a paper in Geophysical Research Letters (“MBH99”) extending their results from AD1400 back to AD1000 (as shown the above figure). In early 2000 the IPCC released the first draft of the TAR. 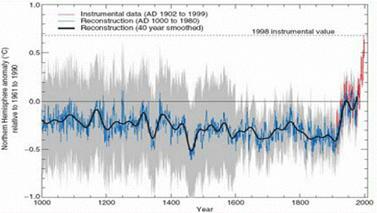 The hockey stick was the only paleoclimate reconstruction shown in the Summary, even though most other scientists disagree with the elimination of the Medieval Warm Period and Little Ice Age. The following figure shows a similar time range as the previous figure from a different source (National Academy of Sciences) – but it’s not exactly a hockey stick. Although the IPCC no longer uses the “hockey-stick” graph, they have replaced it with a “spaghetti-graph” of multiple proxy studies, as shown in the following figure. IPCC AR4 reviewer Steve McIntyre described his review of the usage of bristlecone and foxtail pines in this IPCC temperature proxy figure [http://www.climateaudit.org/?p=2245]. In his review, McIntyre criticized the IPCC for including proxies that were based on bristlecone and foxtail pines (since tree rings from these trees have been shown in various studies to exhibit no correlation with temperature). McIntyre calculated correlations for the included studies and found that some had zero correlation to temperatures at the study locations. The IPCC lead author of the section rejected the reviewer’s comment stating: “the purpose of this Figure is to illustrate in a simple fashion, the variability of numerous records that have been used in published reconstructions of large-scale temperature changes”. The figure shown above also includes the discredited MBH1999 hockey stick. The IPCC went to considerable effort to provide evidence that the warming was unprecedented. 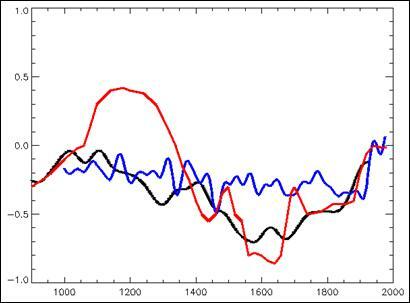 The “hockey-stick” graph produced by Michael Mann (and used by the IPCC and Al Gore) eliminated the Medieval Warm Period and the Little Ice Age in order to exaggerate the 20th century warming. The following table compares the hockey stick used in the TAR with its replacement in the AR4. The adjacent figure shows average northern hemisphere temperature anomalies for the years 1000 - 2000 and is known as the “hockey-stick” graph (due to its shape) as used in the IPCC TAR. The “hockey-stick” graph was eventually debunked by the National Academy of Sciences. There are many reconstructions of temperature records from various proxies, many of which exhibit quite different trends. The following figure shows a comparison of 10 different published reconstructions of mean temperature changes during the last 2000 years. It is unknown which, if any, of these reconstructions is an accurate representation of climate history; however, these curves are a fair representation of the range of results appearing in the published scientific literature. Jones and Mann have made an apparently conscious attempt to eliminate the Little Ice Age from the record. · (blue 1000-1980): Mann, M.E., R.S. Bradley, and M.K. Hughes (1999). 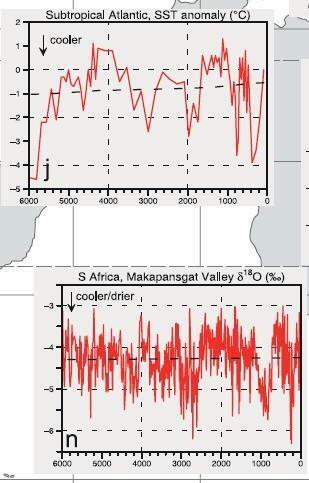 "Northern Hemisphere Temperatures During the Past Millennium: Inferences, Uncertainties, and Limitations". Geophysical Research Letters 26 (6): 759-762. · (light blue 1000-1965): Crowley and Lowery (2000). "Northern Hemisphere Temperature Reconstruction". Ambio 29: 51-54. ; Modified as published in Crowley (2000). "Causes of Climate Change Over the Past 1000 Years". Science 289: 270-277. · (lightest blue 1402-1960): Briffa, K.R., T.J. Osborn, F.H. Schweingruber, I.C. Harris, P.D. Jones, S.G. Shiyatov, and E.A. Vaganov (2001). "Low-frequency temperature variations from a northern tree-ring density network". J. Geophys. Res. 106: 2929-2941. · (light green 831-1992): Esper, J., E.R. Cook, and F.H. Schweingruber (2002). "Low-Frequency Signals in Long Tree-Ring Chronologies for Reconstructing Past Temperature Variability". Science 295 (5563): 2250-2253. Ross McKitrick of the University of Guelph did an in-depth study of Michael Mann’s data used to produce the hockey stick graph. What he found was that Mann used a data analysis method that essentially forced the data sets (mostly tree-ring proxies, but also other proxies) to take the shape of strongest shapes found in any data set. Most of the data sets exhibited no trend. But those that did were weighted in an unrealistic manner. Detailed information about his analysis can be found at http://www.uoguelph.ca/~rmckitri/research/trc.html. The following figure shows two of Mann’s tree-ring proxy data sets. Both series are the same length, but due to the increasing trend in the 20th century in the top panel, Mann’s algorithm gives that series 390 times the weight of the bottom series. The following figure shows one of the results of McKitrick’s analyses where invalid data were removed. 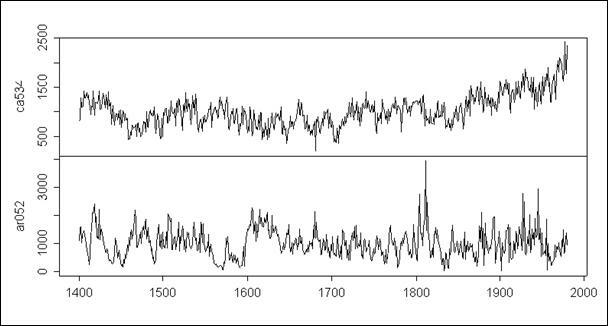 The hockey stick (dashed line) ends up showing the occurrence of the Medieval Warm Period (something that Mann denies occurred). In 2006 a National Academy of Sciences (NAS) panel investigated the hockey stick graph used by the (IPCC) to promote the idea that humans are causing rapid and unprecedented global warming. McKitrick had argued that the hockey stick relied for its shape on the inclusion of a set of invalid proxy data (“strip-bark” records). If they are removed, the conclusion that the 20th century is unusually warm compared to the pre-1450 interval is reversed. Hence the conclusion of unique late 20th century warmth does not hold up under minor variations in data or methods. The NAS panel agreed, saying Mann’s results are “strongly dependent” on the strip-bark data (pp. 106-107), and they went further, warning that strip-bark data should not be used in this type of research (p. 50). McKitrick’s analysis was further backed up by a study by Wegman etc al [Edward J. Wegman, George Mason University, David W. Scott, Rice University, and Yasmin H. Said, The Johns Hopkins University. ], which verified that Mann’s hockey-stick graph was invalid. This refers to a divergence problem: The MBH proxy temperature data sets used to create the hockey stick start showing a decline in temperatures at the end of the data set in the 1980s (when the global average was increasing). They grafted the instrument record onto the data set to show an increase, when in fact the proxies were showing a decrease. The decline being hidden is in the proxy data in the 1980s when the data should have shown an increase if it actually matched the instrumental record. This brings into question the validity of the entire proxy record used by MBH when it doesn’t match the instrumental record in the 1980s. The Medieval Warm Period (MWP) was previously accepted as a warm period that occurred in the time frame of about 1000-1400 AD. That is, until the advent of IPCC and Mann’s hockey stick – now many claim the MWP never happened, or that it was a minimal regional event. But most scientists do not accept the recent IPCC-inspired rejection of the MWP, which was based on Mann’s flawed study. The IPCC 1990 report showed the temperature graph of the red line in the above figure, which indicates the MWP and the Little Ice Age (LIA). But in the IPCC 1995 report, the only pre-instrumental temperature trend figure included uses a northern hemisphere temperature reconstruction, starting in 1400 -thus leaving out the MWP. 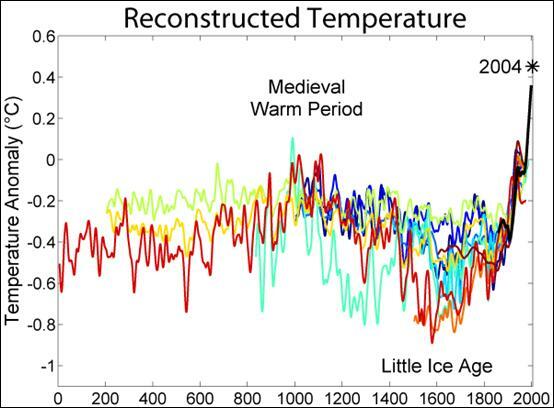 The IPCC 2001 report (TAR) shows temperature reconstructions starting from 1000 AD from Mann, Jones and Briffa and prominently displays the hockey-stick graph as shown previously. The TAR states: “the posited Medieval Warm Period appears to have been less distinct, more moderate in amplitude… The Northern Hemisphere mean temperature estimates of Jones et al. (1998), Mann et al. (1999), and Crowley and Lowery (2000) show temperatures from the 11th to 14th centuries to be about 0.2°C warmer than those from the 15th to 19th centuries, but rather below mid-20th century temperatures. Thus current evidence does not support globally synchronous periods of anomalous cold or warmth over this timeframe, and the conventional terms of "Little Ice Age" and "Medieval Warm Period" appear to have limited utility in describing trends in hemispheric or global mean temperature changes in past centuries”. The University of Southern California course material on climate change in the last millennium [http://earth.usc.edu/geol150/evolution/lastmillenia.html] also provides supporting evidence of the MWP and LIA (although after citing evidence from all continents they say it may be just regional existing only in the northern hemisphere). The following figure is from their paper. The MJ line in a) is the Mann – Jones multi-proxy study while the MBH line in d) is the Mann et al proxy study (the hockey stick) – further evidence of how Mann’s hockey stick does not match reality. One of the proxies included in Moberg et al (above) is the July temperatures at Lake Tsuolbmajavri (Finland) shown in the following figure, based on diatoms in lake sediments. The pro-AGW alarmists have created a red-herring from the MWP issue: They say that the MWP was not global and therefore even if it was warmer than the 1970 – 1990s warming, it doesn’t count because it wasn’t global. See: for more information. The following figure shows eight records of temperature variability on multi-centennial scales throughout the Holocene period (period since the last ice age), as well as an average of these (thick dark line). The records are plotted with respect to the mid 20th century average temperatures, and the global average temperature in 2004 is indicated. This figure can not resolve temperature fluctuations finer than approximately 300 years. The inset plot compares the most recent two millennium of the average to other high resolution reconstructions of this period. The following figures are from Wanner et al “Mid- to Late Holocene climate change: an overview” Quaternary Science Reviews, 2008 [http://www.up.ethz.ch/publications/documents/Wanner_H._et_al._08] showing various climate reconstructions for the past 6000 years. The following figure shows the temperature and CO2 information derived from the Vostok ice cores. In January 1998, the collaborative ice-drilling project between Russia, the United States, and France at the Russian Vostok station in East Antarctica yielded the deepest ice core ever recovered, reaching a depth of 3,623 m. This shows the high correlation between CO2 and temperatures. [From: UNEP/GRID-Arendal. 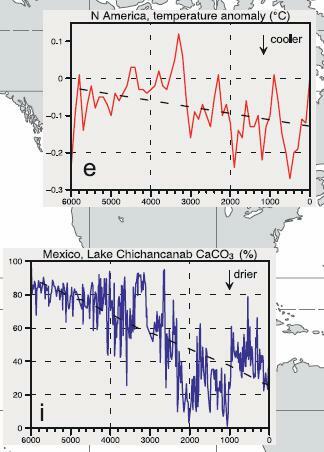 Temperature and CO2 concentration in the atmosphere over the past 400 000 years. The pre-historical record shows a general cooling trend over millions of years with the last million years exhibiting a distinct wide swing in temperature approximately every 100,000 years. Recent global averages are in a range similar to the temperatures of the Medieval Warm Period. Part 2 of this Global Warming Summary document discusses the Medieval Warm Period in greater detail. It is important to remember that the earth’s climate has always changed, and that it is still warming from the last advance of the ice age. The Wisconsin glaciation (shown in the figure below) was the last major advance, ending about 10,000 years ago. Climategate: On Nov 20, 2009 someone hacked a Hadley Climatic Research Unit (CRU) server and obtained emails between several prominent climate researchers (Mann, Jones, Briffa, etc.) and someone put the emails in a searchable database: [http://www.eastangliaemails.com]. The Greenland core is plotted here: http://www.foresight.org/nanodot/?p=3553 and here: http://wattsupwiththat.com/2009/12/12/historical-video-perspective-our-current-unprecedented-global-warming-in-the-context-of-scale/#more-14034 and adapted below.